It has been way too long since I’ve written a blog post and I’m finally sharing this little makeover with you that has more impact than I ever could have imagined! 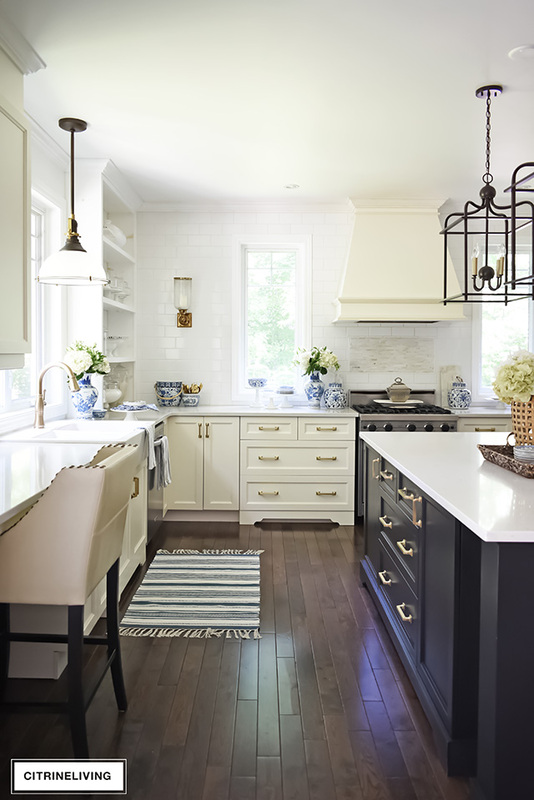 Color is so incredibly transformative and although I LOVED the previous Kelly Green we had in here, I am IN LOVE with this new color and the feeling it gives this space. I hope you’re comfortable! There’s a lot to read about behind my decision making process and the reasons for the choices we made in here. If you feel like just browsing the photos, then I hope you enjoy them! Either way, there’s some great inspiration for you here, as well as source links and shopping options. Happy reading! This is the before. Unfortunately all of my before shots aren’t taken with my good camera, so you really lose a lot of detail. This green was so rich and invigorating and the boldness was truly enveloping. 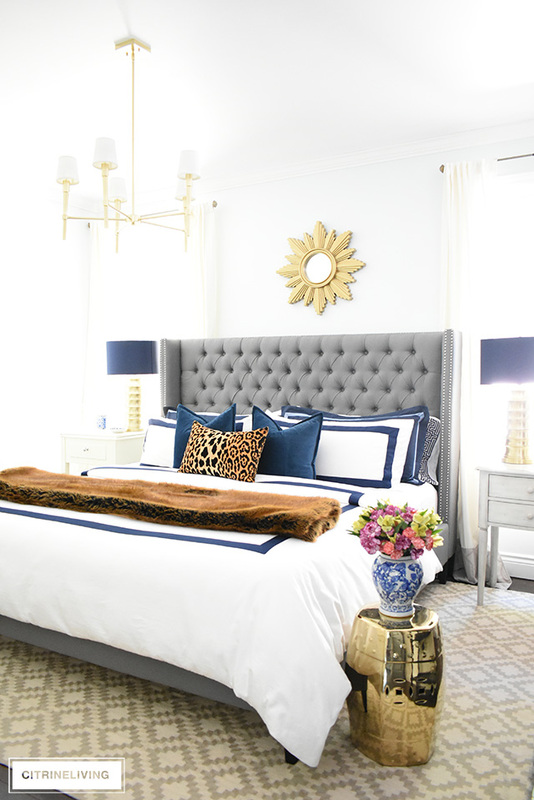 When I designed this room, I had a Palm Beach feeling in mind and I wanted to create a more sophisticated girl’s room rather than something you’d typically find. The coral and green combination, tempered with all the white, in my mind, was the perfect Palm Beach recipe. We have moved the furniture around here in every way possible, I think! One of my biggest challenges with this space was finding the right bedding. With such a specific color palette, it was very difficult! We went from all white, to white and green, to teal to turquoise. You’re probably wondering why the addition of turquoise….well, it was accidental, to be honest. The desk was in our entry and when I finally found a console for that space, I moved the desk in here. This piece is extremely old and it was found in my parents’ house when we moved in, many years ago. 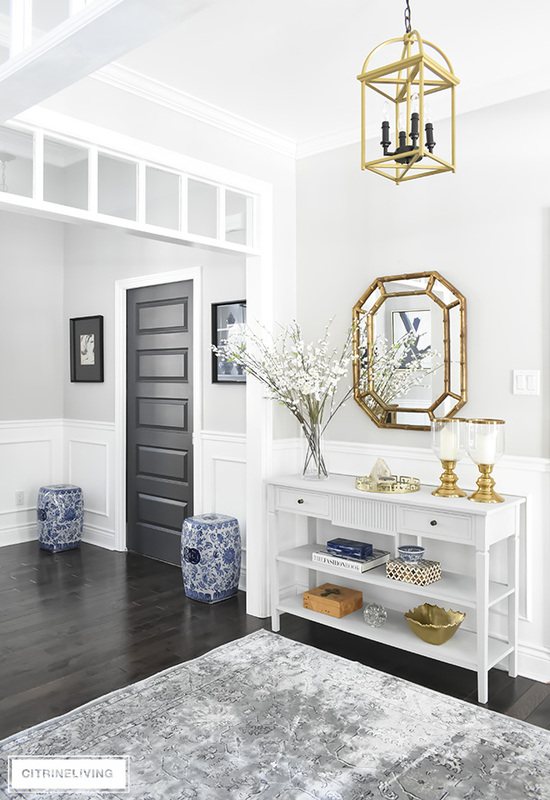 I’ve always loved it’s lines and chinoiserie feel and it was perfect for our daughter’s Palm Beach inspired retreat. 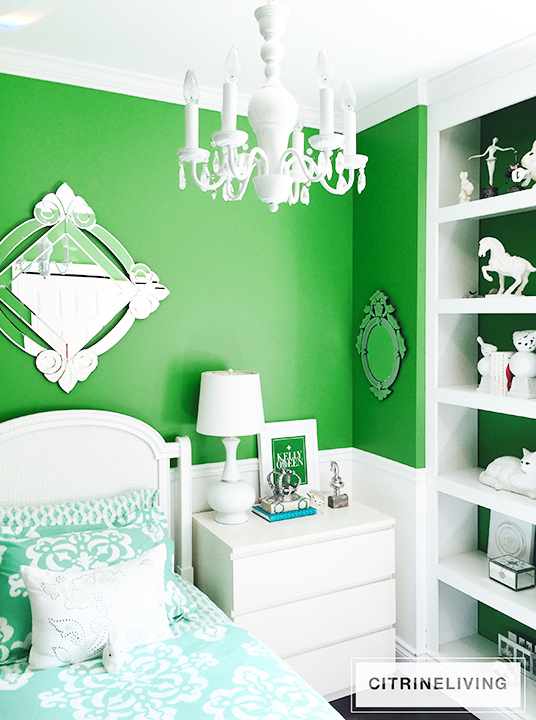 The challenge was figuring out how to marry it with the kelly green that I love so much. 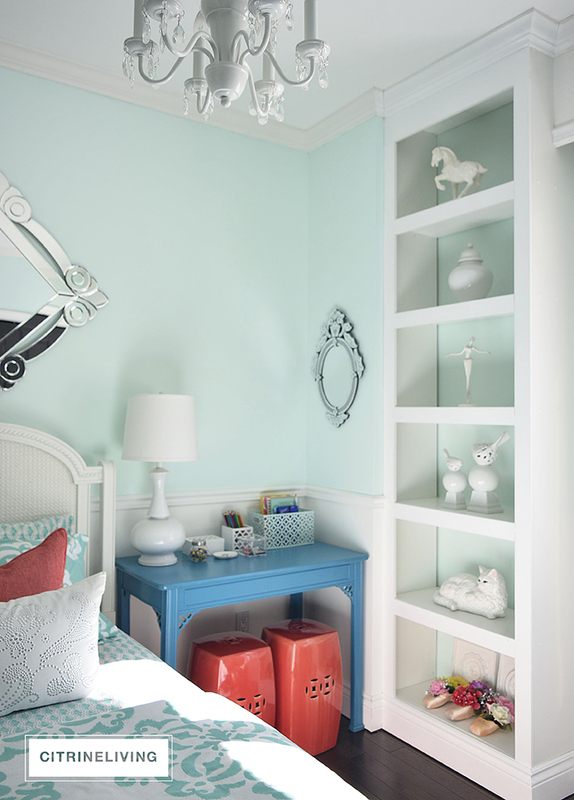 My daughter loved the addition of the turquoise and teal so much, she wanted to change the wall color to turquoise too. I, on the other hand, wasn’t ready to part with this green. After all, I had visions of this room eventually being my office, so for very selfish reasons, I wasn’t ready to paint! Instead, I set out to find the right bedding. Now, although our home is neutral, I do not shy away from pattern or color. In fact, I LOVE it and love to create something unexpected when I use them. I found this bedding, Medallion, in Pool, from Pottery Barn Teen. I loved the pattern and I loved the coordinating sheets as well. The problem was…well, I still didn’t love this mix and the color looked different in this space than I had imagined. The colors are so saturated in this space, I decided it was time to paint after all. I didn’t want to return the bedding, we loved the pattern. The next obvious thing was the walls…I caved to say the least! Quite a huge difference, don’t you think?! 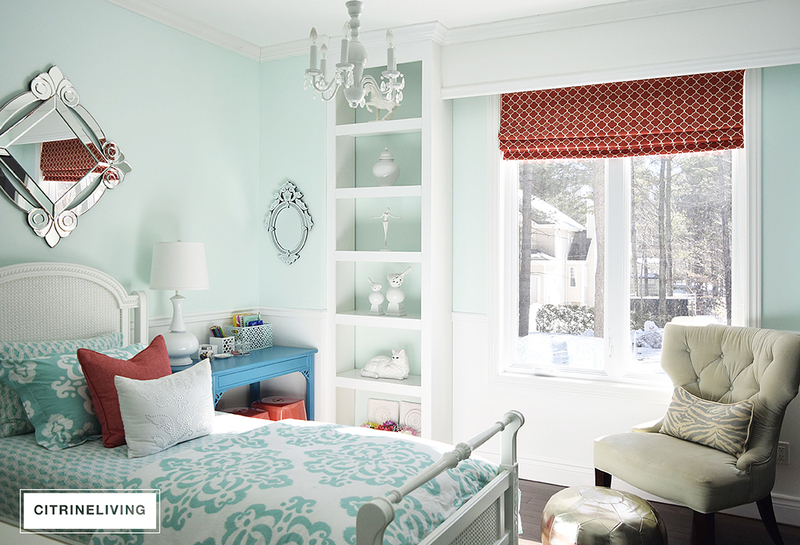 The color is Refreshing Teal by Benjamin Moore. I knew I wanted a very soft, pastel color that would compliment the intensity of the coral and blue-green bedding (which by the way, is not turquoise, it really has a lot of green in it). I can truly say that the color is exactly what it says – refreshing – literally! This room gets full sun almost all day long and everything just glows in here. I actually come and sit in here to work sometimes, I love it so much (I’m not sure how much my daughter likes that though!). Speaking of sitting – this chair was in our master and it landed here by chance. It hasn’t left! It needs a little TLC and I’d love to have reupholstered one day, because the lines are beautiful. Have a look at some other chairs similar to this one, HERE and HERE. Now, I do still love this rug but I may be changing it if I find something I like better. I’m not completely sold that this is the right one in this space, but I really do love it! I’ve sourced some similar ones for you HERE and HERE. Part of the original design of this space was having all white accessories and I still love how this small chandelier works. You can find similar ones HERE and HERE. I would love to replace it eventually with a bamboo style, LIKE THIS, to compliment the chinoiserie elements she has. I found the gold pouf, which I absolutely love and I’ve wanted one for years. This was the perfect spot for it and my daughter LOVES it. You can find one that’s almost the same, right HERE. 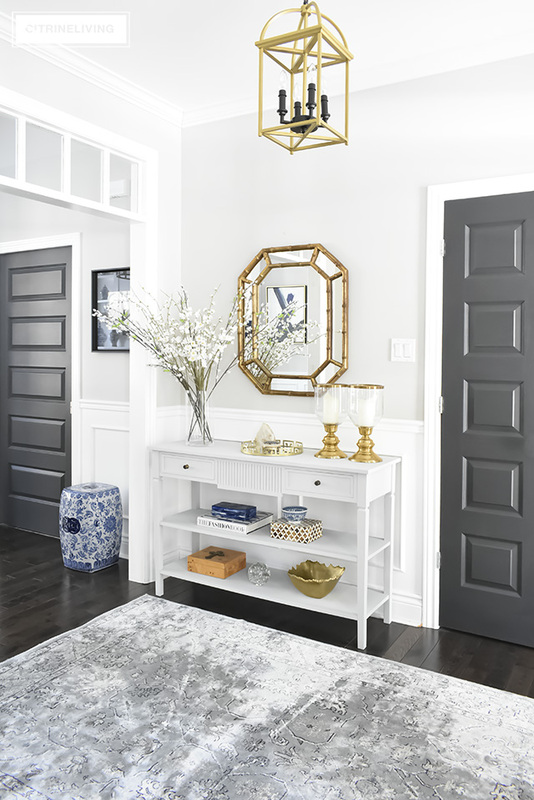 The large mirror is from HomeSense (of course!) and I love the scale of it. THIS ONE is a beautiful option that I sourced for you. The small venetian mirror is from her nursery and I still love it to this day. Another HomeSense buy! You can find similar ones HERE and HERE. You do know I love to mix prints, right?! And if you really know me well, I have Chinese garden stools all over our home. 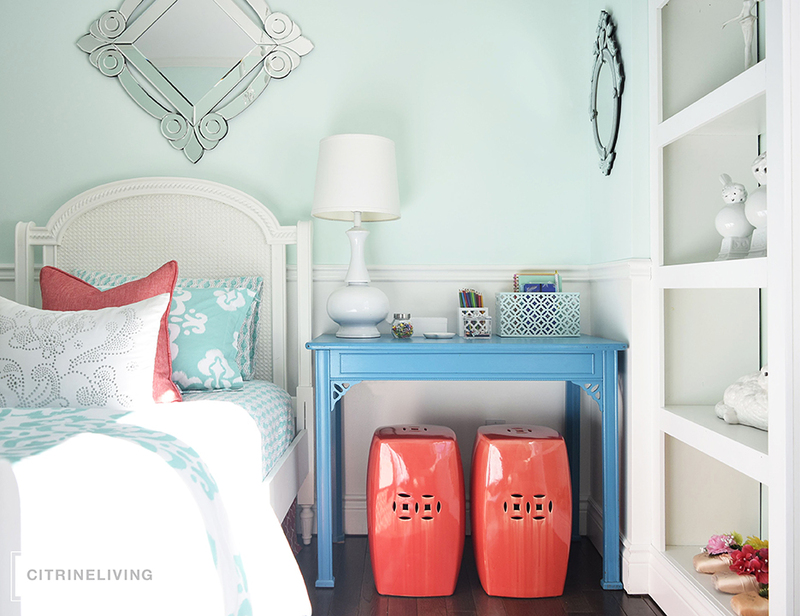 They’re versatile as a side table, as seating and you can tuck them in just about anywhere. These are the perfect coral and match the bedskirt and roman blind beautifully. They do look much more orange here than in reality. I’ve found some similar ones for you HERE as well as HERE. Our daughter just LOVES to collect things, and I really had to purge in this room. She had small little knick knacks covering almost every surface. After I removed everything and put back only the things that have meaning to her, she was thrilled. She absolutely loves this space. That collection of ballet shoes on the bottom shelf is very special to her so even though they’re pink, they stayed! 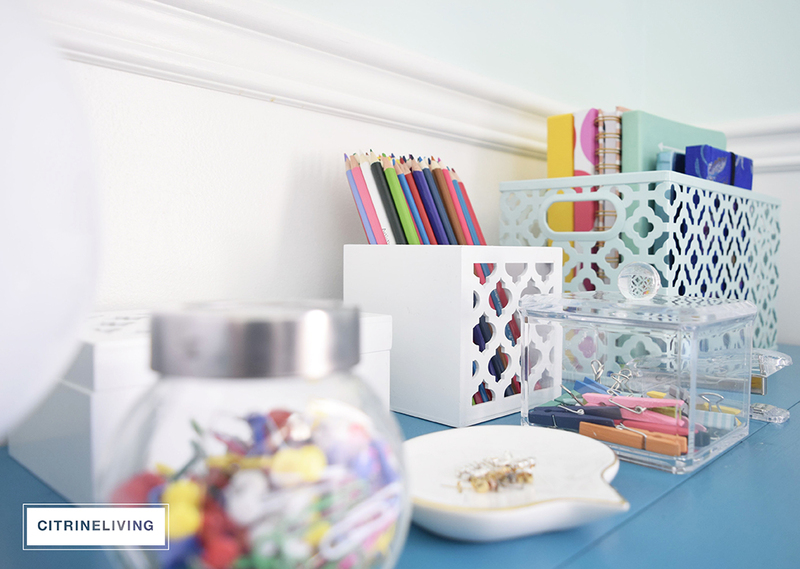 The desk was also a big challenge – keeping her favorite desk accessories clean and organized…more on that further down. I mentioned earlier this desk was found. I did manage to source a similar one HERE for you. I would love to get a Chinese Chippendale chair for this desk and Jonathan Adler makes one that is perfect for this desk. You may also know that I have a collection of fashion illustrations that I sell, you can find them HERE. The colors are customizeable and we chose to hang some for a feature gallery wall. She just loves these and the blue wall creates the perfect backdrop. I personally like to hang different frames for a collected, curated look. We also decided to hang them in a random way rather than anything too perfect, to keep it fun and casual. The Ikea dressers fit in the space well, because it’s tight and they’re small in scale. I would love to get a vintage faux bamboo one for this space as well, like THIS, sold by Parker Kennedy Living through One King’s Lane. I also love THIS ONE, which is new, by Bungalow Five. Some of her favorite things to collect are notebooks and journals. She has one for every topic from cooking and baking (she loves to make up her own recipes!) to math and song lyrics…Thankfully she likes pretty ones like THIS and THIS that work well in her room! Oh, yes and jewelry is another thing that I can’t keep track of, so she has all kinds of boxes for her different collections. HERE is a really cute octagonal one that I found. Fit for a princess, of course! 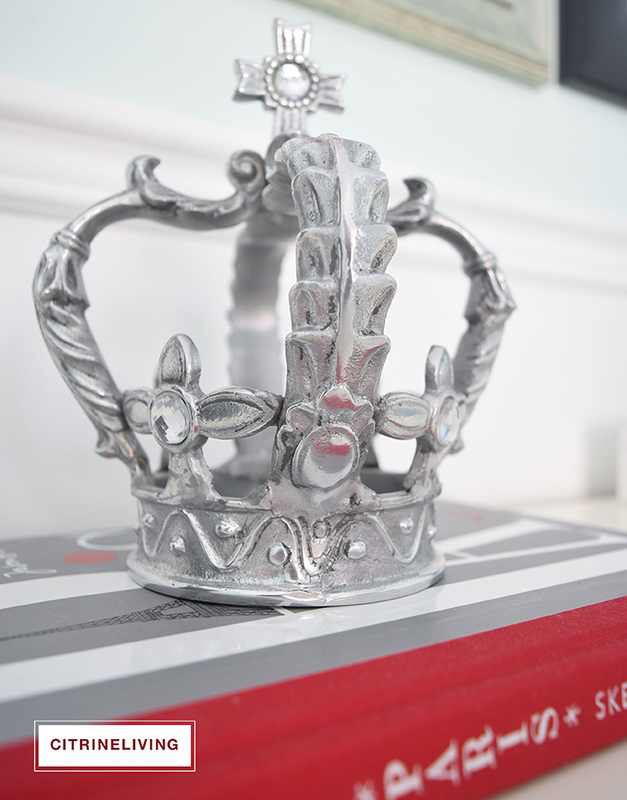 Unique decor and accessories like this crown are a key part of creating this look. The desk was a challenge, as I mentioned above, and finding a way to unify all of her colourful desk accessories was essential. 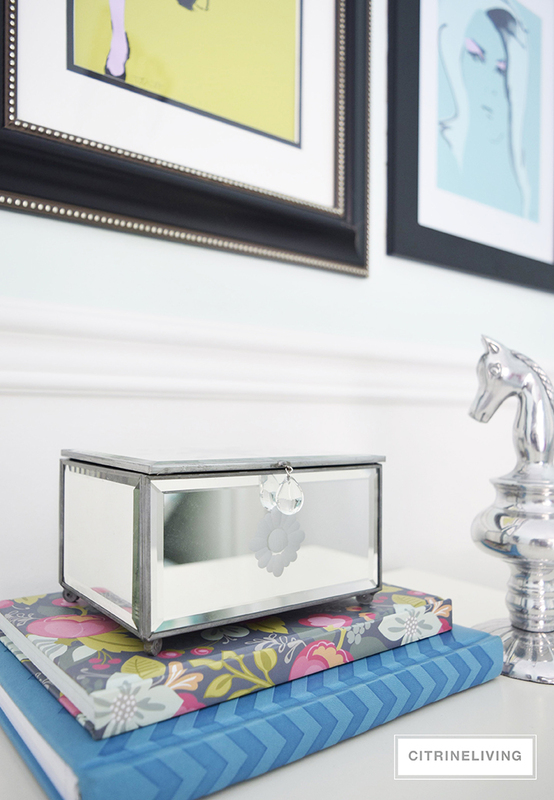 The metal aqua box holds her notebooks – HERE is a similar style. 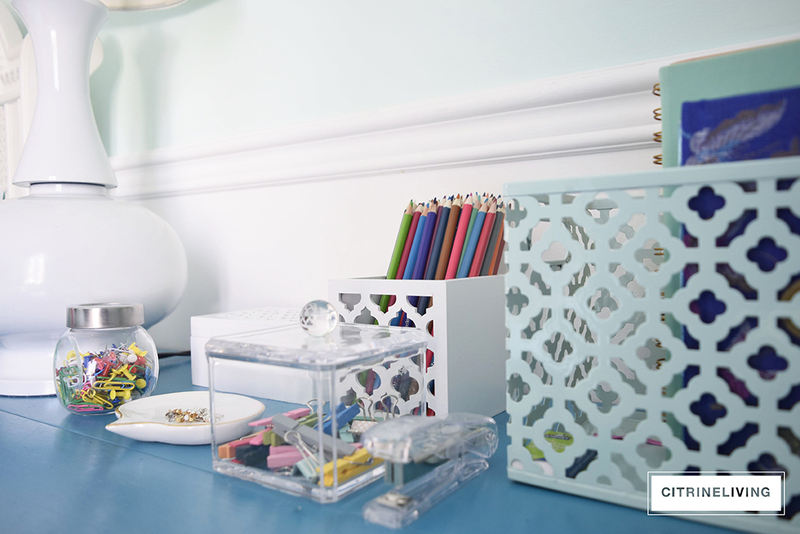 The morrocan motif pencil holder is perfect for her colored pencils as well. I love how you can see the colors through it. 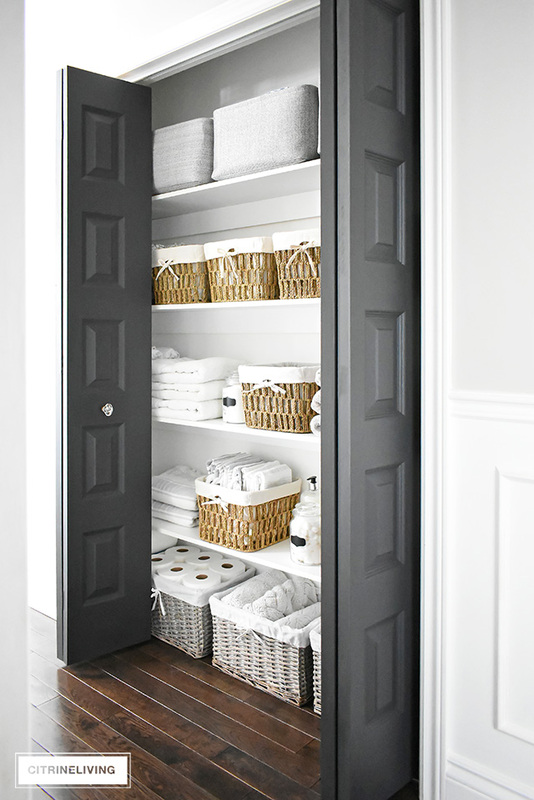 I mixed various pieces together, but I found some gorgeous sets for you, both from Pottery Barn Teen, HERE and HERE. The stapler was a must! She had to have it and it’s from the dollar store – HERE is a cute little option. 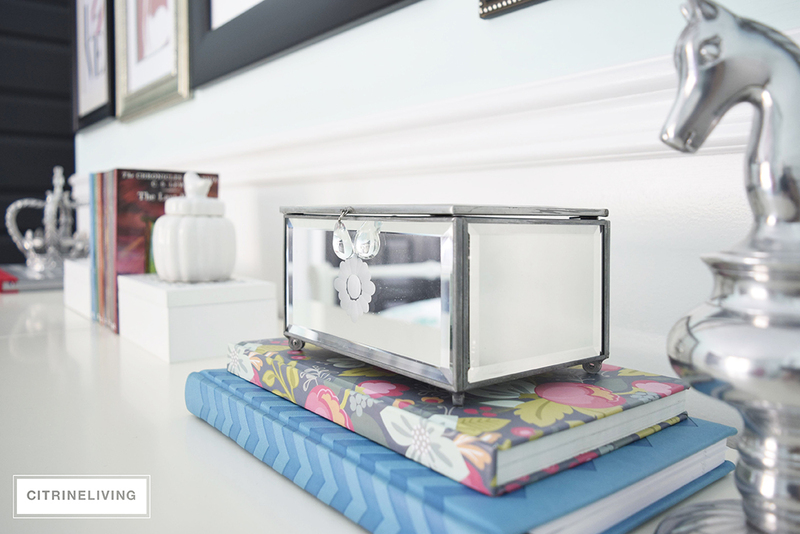 The acrylic box was in our bathroom and it is perfect or those adorable mini clips she has. I’ve decided to leave the window open and haven’t hung the white drapes back up yet, I love the openness and the room feels bigger and brighter. The roman blind, which is custom made (by my talented mother in law! 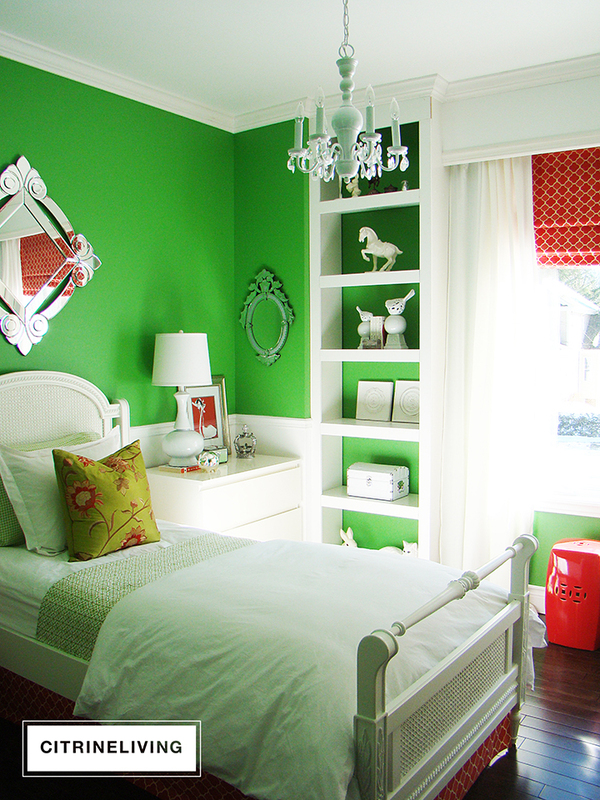 ), is stunning in this space and it was gorgeous paired with the green before as well. It really pops as you enter the room. That wraps up the updates we finally made in here. This is a small space, only about 91/2 x 12 feet and I can say that going from the bold kelly green to this lively pale teal, really adds an airy lightness that we love. It doesn’t necessarily feel bigger, but the brightness it creates, even on a cloudy day, elevates your mood. Color has so much impact visually and emotionally. The green was happy, strong and very bold – very much like our daughter! Although completely different, this teal has a similar effect but so much more invigorating and happy. We love it – even her brother thinks it’s a great choice! 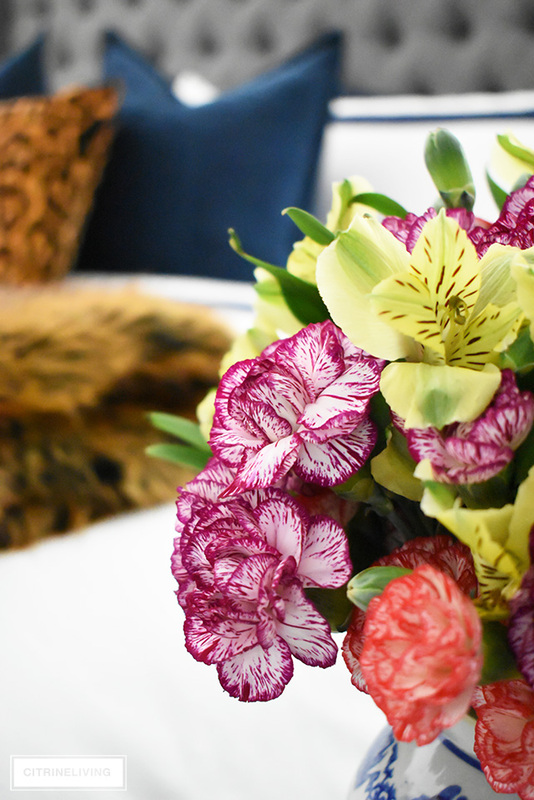 SPRING INSPIRATION AND A FEW THINGS THAT I'M LOVING! Oh how I wish I had a room like this as a kid! Love the new wall color! Just love all the different textures and accessories. Such a sophisticated and yet fun room. Fabulous job Tam! Thank you so much, Kim!! I’m happy you like it! I love the colors in the room.. She can enjoy now and it will grow as she does.. Elegant. Tamara! This room is absolutely gorgeous my friend! You have such a way with mixing patterns and colors that I absolutely adore and admire!! 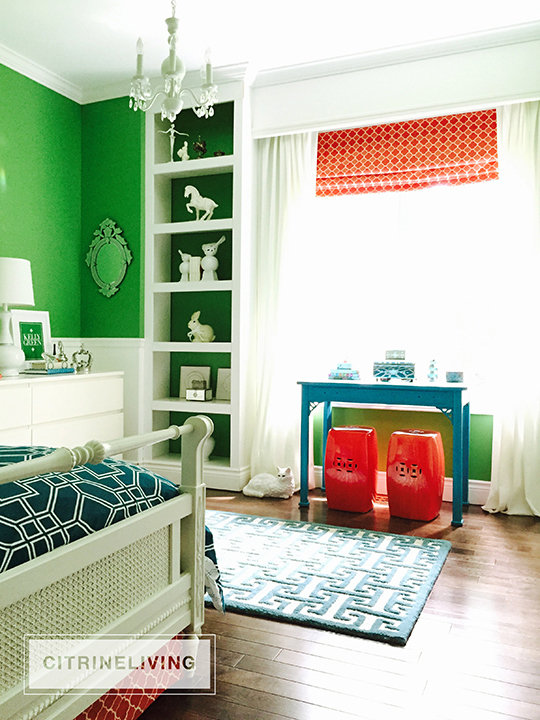 I bet your daughter is really enjoying this light and airy refresh and I couldn’t agree more!! Stunning job my friend? Thank you so much! It’s definitely a fun way to get your creative juices flowing! 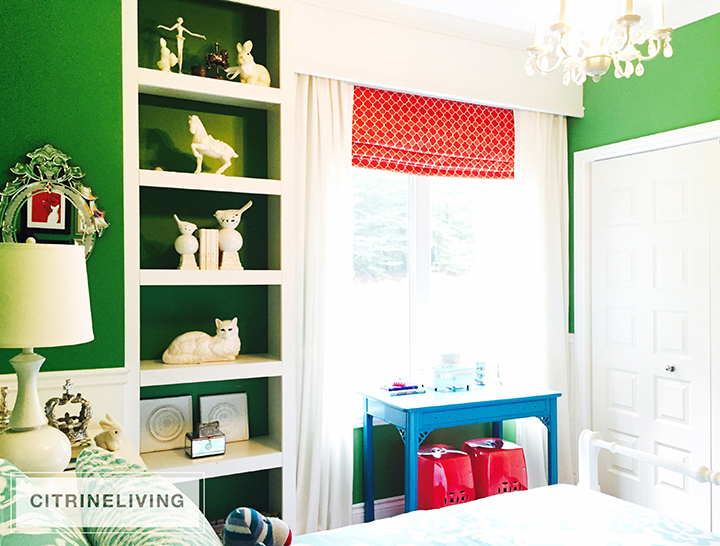 Especially in kids rooms…I’m thrilled you like it! We still love it too :) Thanks so much for visiting! I love your room! (Your entire blog actually!) My daughter and I are using parts of your suggestions as inspiration for her new room. May I ask about the bed’s foundation? I found an antique twin metal bed and painted it white…bought a box spring today and it’s so tall that the footboard is at the top of the mattress. It almost needs a stool to get in the bed. Hi Tamara! I found myself perusing your website today…I have been on it a few times before but today, I was completely sucked in :) I think I saw this room when you posted it originally, but I’m finding myself admiring again today. It’s just fantastic! 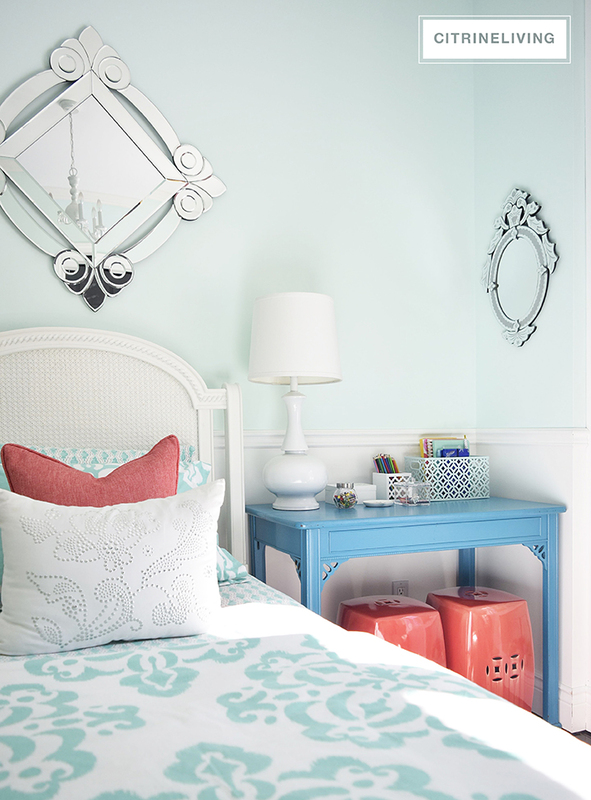 I absolutely love the coral and teal wall colour combination. 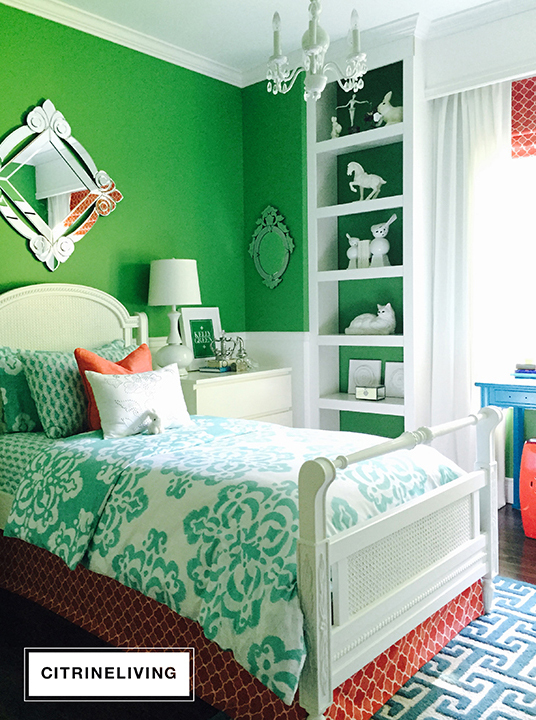 It’s spectacular and your daughter must love her room. I am contemplating a version of this colour scheme in our bedroom now. Amazing! Beautiful room! I am currently working on my daughter’s room. I’m considering this color. I am doing 1 wall with wallpaper as an accent wall. Amy that sounds like it will be beautiful! Thank you so much for the compliment and thank you for stopping gin to say hi! Good luck with your daughter’s bedroom!